This Celina Tent brand frame tent uses less hardware than traditional frame models. Its cinch top installs quickly and provides a tight, clean appearance. The top, built of tough 16 oz. 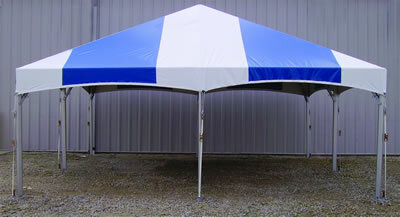 blockout vinyl, features bonded top panels with 1" heat-sealed overlapped seams for 95% of the tent top. Reinforcement patches at the crowns ensures durability in these areas subject to extra stress. The polyester side curtain rope is securely held in with 1" polyester webbing that is sewn approximately every 15" around the perimeter of the tent. The tent includes a durable galvanized steel pole kit and a user-friendly instruction manual for assembly and care.